Darlings, who knew it would be so easy to recreate that flavorful memory that I’m about to share with you in a minute? Four ingredients! These delights are super easy to make, and ready in under 10 minutes! Sounds good, right? But wait, there’s more. These no bake energy bites are naturally sweet, packed with flavor, taste sensational, although I’ll let you be the judge of that. 🙂 Plus, they’re low carb! Only 9 gr of carbs in a serving. Yum! So, let’s brighten up our snack time, and indulge in these flavorful bites. First, blend the cashews in a *food processor. Next, add the cranberries and dates and **blend until all that goodness is combined. **However, if you don’t have a strong food processor, then do this step in batches, that way you won’t over work your food processor. 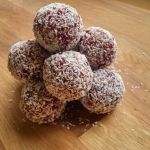 Roll into balls, then into the shredded coconut. Repeat until all your scrumptious no bake energy bites are coated. Did you like this super easy recipe? Go ahead and share it with your friends. They’ll thank you! 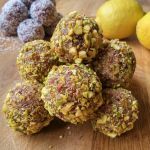 Have you checked out my delicious Pistachio And Lemon Energy Balls yet? What are you waiting for? They’re just as good!